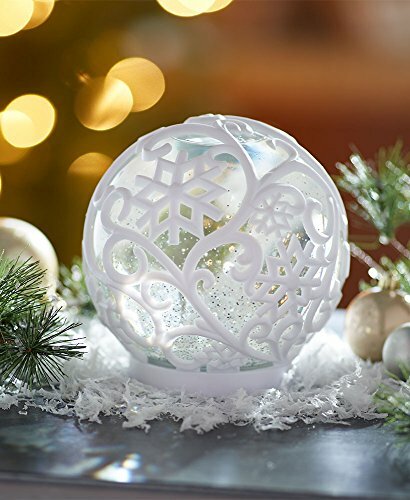 Add a lighted element to your home decor with this Oversized Color-Changing Waterball. It’s perfect for the winter or holiday season. It has a motor that spins the glitter around for a mesmerizing display. Has two color settings: warm white or color changing from shades of red, pink, green, light blue, dark blue and purple. Includes a 6 hours on/18 hours off timer. On/off switch. Requires 3 “AA” batteries. 6-1/4″ dia. x 6-5/8″H. Water and plastic.